Some of today’s most controversial anti-white, anti-Trump professors are headlining the event, which boasts more than 100 workshops committed to tearing down our country, “building a socialist society,” and covering the debates on the left along with the hidden history of working-class and socialist struggles. In layman’s terms, the conference is predicated upon stripping down America, its values and its history and recreating and rebuilding it as a socialist country. 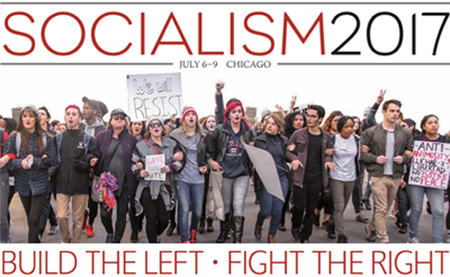 The socialist event will address topics such as Marxism and Stalinism, misogyny, Islamophobia, immigration, racism, the “alt-right enemy,” anti-capitalism, anti-Semitism and other issues from the viewpoint of the progressive Socialist. It will also provide a pulpit for Black Lives Matter founder Alicia Garza. “Fighting Racism in Trump’s America” will be led by Keeanga-Yamahtta Taylor, the Black Lives Matter enthusiast and professor who spoke at the commencement for Hampshire College and called President Trump a “racist, sexist megalomaniac” and received death threats and hate emails after it aired on Fox News. Taylor will deliver a speech about building “a massive movement against racism, sexism, and bigotry” in America. It will be the same speech she previously cancelled due to backlash for her hate-speech directed at the president. Syracuse University professor Dana Cloud will dissect the role of the media in the Socialist Worker-Sponsored Meeting: “Lies, Damn Lies, and Fake News.” She will discuss how “not all governments lie as proudly as those led by Donald Trump,” and Trump’s “obvious disdain for the truth” as well as the role of the “right-wing outlets” like “Breitbart” and “Fox News” and how they “do whatever they can to fuel the right’s agenda.” She will also touch on the importance of the socialist movement having its own independent voice. There’s no mention in the brochure on whether CNN or the New York Times will be celebrated for disseminating fabricated news. Cloud has denied that her tweet was intended to incite violence against the conservative demonstrators, but the organizer of the Syracuse march disputed that assertion and said it was evident Cloud was trying to shut down free speech and incite violence. One of the more inconceivable and mindboggling workshops, “A User’s Guide to Marxism: Anarchism,” instructs that in order to create a Marxist society, opposition to all authority – especially state authority – as well as a revolution is necessary. The speaker, Coco Smyth, is a history student and socialist organizer at Ohio State University. Dana Blanchard, an elementary school teacher from California, will be on hand for the class “Socialism 101” and discuss what kind of political movement will be necessary to break down our capitalistic society and convert to socialism. The workshop “Fighting the Neo-Liberal Attack on Higher Education” promises to be instruction in anti-American thoughts and ideals and the rejection of the capitalistic society America was built on. Speaker Alain Savard, who was active in the Quebec student movement and an officer for the “radical provincial student federation,” will lead the discussion on how to “organize to resist and transform” today’s neoliberal university into a socialist university. Conference organizers are enticing students to attend with 50 percent off their registration. They are also marketing the conference to students as a great way to meet like-minded socialist students who think the world is in crisis and socialism is the cure. Let the revolution begin. Starting with gun reform legislation.